The narratives can be very different for the paper “A model for verbalising relations with roles in multiple languages” that was recently accepted paper at the 20th International Conference on Knowledge Engineering and Knowledge management (EKAW’16), for the paper makes a nice smoothie of the three ingredients of language, logic, and ontology. The natural language part zooms in on isiZulu as use case (possibly losing some ontologist or logician readers), then there are the logics about mapping the Description Logic DLR’s role components with OWL (lose possible interest of the natural language researchers), and a bit of philosophy (and lose most people…). It solves some thorny issues when trying to verbalise complicated verbs that we need for knowledge-to-text natural language generation in isiZulu and some other languages (e.g., German). And it solves the matching of logic-based representations popularised in mainly UML and ORM (that typically uses a logic in the DLR family of Description Logic languages) with the more commonly used OWL. The latter is even implemented as a Protégé plugin. Let me start with some use-cases that cause problems that need to be solved. It is well-known that natural language renderings of ontologies facilitate communication with domain experts who are expected to model and validate the represented knowledge. This is doable for English, with ACE in the lead, but it isn’t for grammatically richer languages. There, there are complications, such as conjugation of verbs, an article that may be dependent on the preposition, or a preposition may modify the noun. For instance, works for, made by, located in, and is part of are quite common names for object properties in ontologies. They all do have a dependent preposition, however, there are different verb tenses, and the latter has a copulative and noun rather than just a verb. All that goes into the object properties name in an ‘English-based ontology’ and does not really have to be processed further in ontology verbalisation other than beautification. Not so in multiple other languages. For instance, the ‘in’ of located in ends up as affixes to the noun representing the object that the other object is located in. Like, imvilophu ‘envelope’ and emvilophini ‘in the envelope’ (locative underlined). Even something straightforward like a property eats can end up having to be conjugated differently depending on who’s eating: when a human eats, it is udla in isiZulu, but for, say, a dog, it is idla (modification underlined), which is driven by the system of noun classes, of which there are 17 in isiZulu. Many more examples illustrating different issues are described in the paper. To make a long story short, there are gradations in complicating effects, from no effect where a preposition can be squeezed in with the verb in naming an OP, to phonological conditioning, to modifying the article of the noun to modifying the noun. A ‘3rd pers. sg.’ may thus be context-dependent, and notions of prepositions may modify the verb or the noun or the article of the noun, or both. For a setting other than English ontologies (e.g., Greek, German, Lithuanian), a preposition may belong neither to the verb nor to the noun, but instead to the role that the object plays in the relation described by the verb in the sentence. For instance, one obtains yomuntu, rather than the basic noun umuntu, if it plays the role of the whole in a part-whole relation like in ‘heart is part of a human’ (inhliziyo iyingxenye yomuntu). The question then becomes how to handle such a representation that also has to include roles? This is quite common in conceptual data modelling languages and in the DLR family of DL languages, which is known in ontology as positionalism . Bumping up the role to an element in the representation language—thus, in addition to the relationship—enables one to attach information to it, like whether there is a (deep) preposition associated with it, the tense, or the case. Such role-based annotations can then be used to generate the right element, like einen Betrieb ‘some company’ to adjust the article for the case it goes with in German, or ya+umuntu=yomuntu ‘of a human’, modifying the noun in the object position in the sentence. To get this working properly, with a solid theoretical foundation, we reused a part of the conceptual modelling languages’ metamodel  to create a language model for such annotations, in particular regarding the attributes of the classes in the metamodel. On its own, however, it is rather isolated and not immediately useful for ontologies that we set out to be in need of verbalising. To this end, it links to the ‘OWL way of representing relations’ (ontologically: the so-called standard view), and we separate out the logic-based representation from the readings that one can generate with the structured representation of the knowledge. All in all, the simplified high-level model looks like the picture below. That much for the conceptual part; more details are described in the paper. 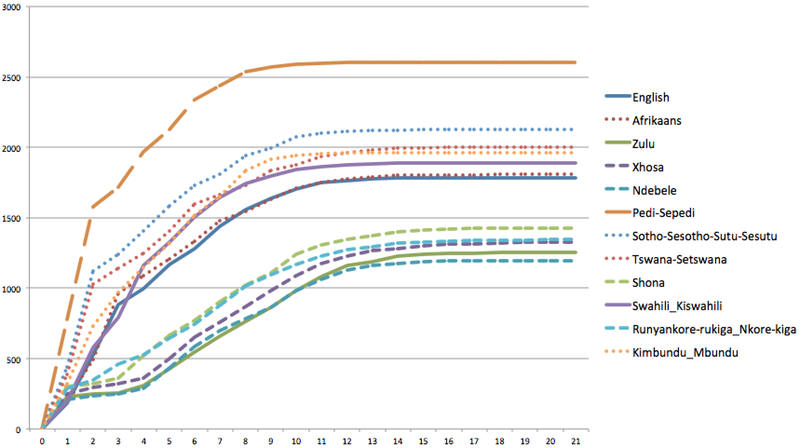 Just a fluffy colourful diagram isn’t enough for a solid implementation, however. To this end, we mapped one of the logics that adhere to positionalism to one of the standard view, being DLR  and OWL, respectively. It equally well could have been done for other pairs of languages (e.g., with Common Logic), but these two are more popular in terms of theory and tools. OWL’s arbeitetFuer ‘works for’ is linked to the relationship arbeiten. The prey role in the axiom of the impala being eaten by the ibhubesi. Annotations of the prey role itself, which is a role in the relationship ukudla. We did test it a bit, from just the regular feature testing to the African Wildlife ontology that was translated into isiZulu (spoken in South Africa) and a people and pets ontology in ciShona (spoken in Zimbabwe). These details are available in the online supplementary material. The next step is to tie it all together, being the verbalisation patterns for isiZulu [5,6] and the OWL ontologies to generate full sentences, correctly. This is set to happen soon (provided all the protests don’t mess up the planning too much). If you want to know more details that are not, or not clearly, in the paper, then please have a look at the project page of A Grammar engine for Nguni natural language interfaces (GeNi), or come visit EKAW16 that will be held from 21-23 November in Bologna, Italy, where I will present the paper. Leo, J. Modeling relations. Journal of Philosophical Logic, 2008, 37:353-385. Keet, C.M., Fillottrani, P.R. 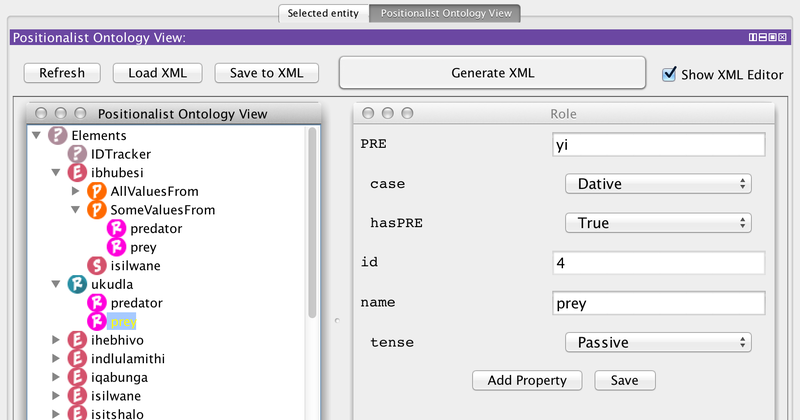 An ontology-driven unifying metamodel of UML Class Diagrams, EER, and ORM2. Data & Knowledge Engineering, 2015, 98:30-53. Calvanese, D., De Giacomo, G. The Description Logics Handbook: Theory, Implementation and Applications, chap. Expressive description logics, pp. 178-218. Cambridge University Press (2003). Keet, C.M., Khumalo, L. Toward a knowledge-to-text controlled natural language of isiZulu. Language Resources and Evaluation, 2016, in print. Keet, C.M., Khumalo, L. On the verbalization patterns of part-whole relations in isiZulu. Proceedings of the 9th International Natural Language Generation conference 2016 (INLG’16), Edinburgh, Scotland, Sept 2016. ACL, 174-183. It is well-known that natural language interfaces and tools in one’s own language are known to be useful in ICT-mediated communication. For instance, tools like spellcheckers and Web search engines, machine translation, or even just straight-forward natural language processing to at least ‘understand’ documents and find the right one with a keyword search. Most languages in Southern Africa, and those in the (linguistically called) Bantu language family, are still under-resourced, however, so this is not a trivial task due to the limited data and researched and documented grammar. Any possibility to ‘bootstrap’ theory, techniques, and tools developed for one language and to fiddle just a bit to make it work for a similar one will save many resources compared to starting from scratch time and again. Likewise, it would be very useful if both the generic and the few language-specific NLP tools for the well-resourced languages could be reused or easily adapted across languages. The question is: does that work? We know very little about whether it does. Taking one step back, then: for that bootstrapping to work well, we need to have insight into how similar the languages are. And we may be able to find that out if only we knew how to measure similarity of languages. The most well-know qualitative way for determining some notion of similarity started with Meinhof’s noun class system  and the Guthrie zones. That’s interesting, but not nearly enough for computational tools. An experiment has been done for morphological analysers , with promising results, yet it also had more of a qualitative flavour to it. I’m adding here another proverbial “2 cents” to it, by taking a mostly quantitative approach to it, and focusing on orthography (how things are written down) in text documents and corpora. This was a two-step process. First, 12 versions of the Universal Declaration of Human Rights were examined on tokens and their word length; second, because the UDHR is a quite small document, isiZulu corpora were examined to see whether the UDHR was a representative sample, i.e., whether extrapolation from its results may be justified. The methods, results, and discussion are described in “An assessment of orthographic similarity measures for several African languages” . The really cool thing of the language comparison is that it shows clusters of languages, indicating where bootstrapping may have more or less success, and they do not quite match with Guthrie zones. The cumulative frequency distributions of the words in the UDHR of several languages spoken in Sub-Saharan Africa is shown in the figure below, where the names of the languages are those of the file names of the NLTK data kit that contains the quality translations of the UDHR. Cumulative frequency distributions of the words in the UDHR of several languages spoken in Sub-Saharan Africa (Source: ). The paper contains some statistical tests, showing that the bottom cluster are not statistically significantly different form each other, but they are from the ‘middle’ cluster. So, the word length distribution of Kiswahili is substantially different from that of, among others, isiZulu, in that it has more shorter words and isiZulu more longer words, but Kiswahili’s pattern is similar to that of Afrikaans and English. This is important for NLP, for isiZulu is known to be highly agglutinating, but English (and thus also Kiswahili) is disjunctive. How important is such a difference? The simple answer is that grammatical elements of a sentences get ‘glued’ together in isiZulu, whereas at least some of them are written as separate words in Kiswahili. This is not to be conflated with, say, German, Dutch, and Afrikaans, where nouns can be concatenated to form new words, but, e.g., a preposition is glued onto a noun. For instance, ‘of clay’ is ngobumba, contracting nga+ubumba with a vowel coalescence rule (-a + u- = -o-), which thus happens much less often in a language with disjunctive orthography. This, in turn, affects the algorithms needed to computationally process the languages, hence, the prospects for bootstrapping. Note that middle cluster looks deceptively isolating, but it isn’t. Sesotho and Setswana are statistically significantly different from the others, in that they are even more disjunctive than English. Sepedi (top-most line) even more so. While I don’t know that language, a hypothetical example suffice to illustrate this notion. There is conjugation of verbs, like ‘works’ or trabajas or usebenza (inflection underlined), but some orthographer a while ago could have decided to write that separate from the verb stem (e.g., trabaj as and u sebenza instead), hence, generating more tokens with fewer characters. There are other aspects of language and orthography one can ‘play’ with to analyse quantitatively, like whether words mainly end in a vowel or not, and which vowel mostly, and whether two successive vowels are acceptable for a language (for some, it isn’t). This is further described in the paper . Yet, the UDHR is just one document. To examine the generalisability of these observations, we need to know whether the UDHR text is a ‘typical’ one. This was assessed in more detail by zooming in on isiZulu both quantitatively and qualitatively with four other corpora and texts in different genres. The results show that the UHDR is a typical text document orthographically, at least for the cumulative frequency distribution of the word length. There were some other differences across the other corpora, which have to do with genre and datedness, which was observed elsewhere for whole words . For instance, news items of isiZulu newspapers nowadays include words like iFacebook and EFF, which surely don’t occur in a century-old bible translation. They do violate the ‘no two successive vowels’ rule and the ‘final vowel’ rule, though. On the qualitative side of the matter, and which will have an effect on searching for information in texts, text summarization, and error correction of spellcheckers, is, again, that agglutination. For instance, searching on imali ‘money’ alone would be woefully inadequate to find all relevant texts; e.g., those news items also include kwemali, yimali, onemali, osozimali, kwezimali, and ngezimali, which are, respectively of -, and -, that/which/who has -, of – (pl. ), about/by/with/per – (pl.) money. Searching on the stem or root only is not going to help you much either, however. Take, for instance -fund-, of which the results of just two days of Isolezwe news articles is shown in the table below (articles from 2015, when there were protests, too). Depending on what comes before fund and what comes after it, it can have a different meaning, such as abafundi ‘students’ and azifundi ‘they do not learn’. Placing this is the broader NLP scope, it also affects the widely-used notion of lexical diversity, which, in its basic form, is a type-to-token ratio. Lexical diversity is used as a proxy measure for ‘difficulty’ or level of a text (the higher the more difficult), language development in humans as they grow up, second-language learning, and related topics. 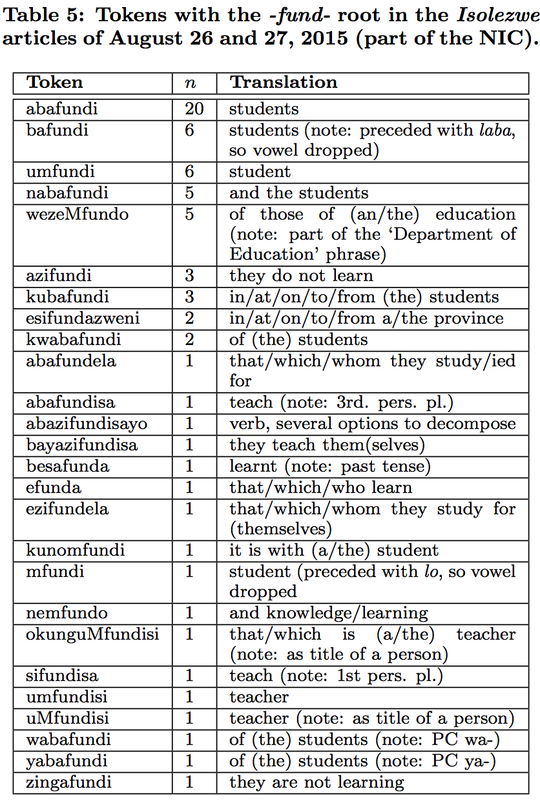 Letting that loose on isiZulu text, it will count abafundi, bafundi, and nabafundi as three different tokens, so wheehee, high lexical diversity, yet in English, it amounts to ‘students’, ‘students’ and ‘and the students’. Put differently, somehow we have to come up with a more meaningful notion of lexical diversity for agglutinating languages. A first attempt is made in the paper in its section 4 . Thus, the last word has not been said yet about orthographic similarity, yet we now do have more insight into it. The surprising similarity of isiZulu (South Africa) with Runyankore (Uganda) was exploited in another research activity, and shown to be very amenable to bootstrapping , so, in its own way providing supporting evidence for bootstrapping potential that the figure above also indicated as promising. As a final comment on the tooling side of things, I did use NLTK (Python). It worked well for basic analyses of text, but it (and similar NLP tools) will need considerable customization for the agglutinating languages. C. Meinhof. 1932. Introduction to the phonology of the Bantu languages . Dietrich Reiner/Ernst Vohsen, Johannesburg. Translated, revised and enlarged in collaboration with the author and Dr. Alice Werner by N.J. Van Warmelo. L. Pretorius and S. Bosch. Exploiting cross-linguistic similarities in Zulu and Xhosa computational morphology: Facing the challenge of a disjunctive orthography. In Proceedings of the EACL 2009 Workshop on Language Technologies for African Languages – AfLaT 2009, pages 96–103, 2009. C.M. Keet. An assessment of orthographic similarity measures for several African languages. Technical report, arxiv 1608.03065. August 2016. J. Byamugisha, C. M. Keet, and B. DeRenzi. Bootstrapping a Runyankore CNL from an isiZulu CNL. In B. Davis et al., editors, 5th Workshop on Controlled Natural Language (CNL’16), volume 9767 of LNAI, pages 25–36. Springer, 2016. 25-27 July 2016, Aberdeen, UK.